I remember my elderly neighbour’s words as if it was yesterday rather than multiple decades ago. “Yeah sure” I replied, but had I known the hard day’s labor that was ahead of me I might not have been so enthusiastic. We walked around to his back garden and it was like a jungle. I half expected wild animals to jump out at any moment. “Here, you can use this.” He said while pointing to the oldest, rustiest push cylinder mower in existence. It was so rusted it barely moved, let alone cut anything. After arduously struggling with this contraption for hours to no avail, I popped back home grabbed a pair of hand shears and came back and finished the job that way. I swear, for years later just the hearing the word lawnmower broke me out in a sweat. Luckily things have advanced a bit since old Bob’s push mower. These days there are so many choices to make when buying a lawnmower, it’s easy to get confused and either overspend on something you don’t need or end up buying a lawnmower that isn’t up to the task. In this article I’m going to try to shed some light on the subject and hopefully making your next lawnmower purchase a little better informed. I’ll be talking about the different types of lawnmower, power types and drive types and comparing their pros and cons. I’ll also be sharing with you selection of lawnmower reviews and picking out the best of them for various categories. Let’s get started shall we? Petrol lawnmowers have been around for years and are still the go to choice for many gardeners. They are more powerful than electric lawnmowers and can make easy work of long or tough grass and can seriously cut down the time it takes to mow a large lawn. The lack of cord also makes them a great choice for larger gardens and, unlike battery powered lawnmowers, they don’t have to be charged before use. However, they do need to be regularly maintained and filled with petrol. They are also heavier and noisier than electric lawnmowers. Petrol mowers usually range from 2-7 horsepower, and obviously the bigger the lawn, the more power you’ll need. There are many types and variations of lawnmowers and some crossover into other genres so for clarity, I’ll keep it simple in this section and only talk about rotary petrol lawnmowers and cylinder petrol lawnmowers. This is my number 1 pick for a low priced, stand behind petrol lawnmower. This great looking mower gives you a lot of bang for your buck. Priced at £129.99, its 99cc 4 stroke engine delivers solid cutting power without the excessive noise you sometimes get with petrol lawnmowers. It’s extremely fuel efficient, keeping running costs low and has been designed to be low maintenance making it perfect for those of us who aren’t the most mechanically gifted. The large, 200mm back wheels make this lawnmower easy to move around and the 400mm cutting width makes it ideal for gardens up to 20m x 20m. The machine is easy to start, just press the primer button a few times, grip the handle with your left hand and then pull the starter cord with your right. There is also the option to place the recoil cord at the top of the handle which allows you to stay upright when starting it, reducing the risk of back pain or injuries. The Hyundai 99cc engine feels nice when it propels its self forward and when that mode is switched off, this is a very easy petrol lawnmower to reverse. There is a height adjustment lever which allows you to select from 6 different cutting heights ranging from 25mm to 75mm. At 40 litres, the grass catcher bag is spacious enough so that you don’t have to stop and empty it too often. When it is time to empty it, it comes off and reattaches with minimal fuss although the engine has to be turned off as a safety feature. The Mountfield HP41 is my second choice of petrol lawnmower in this low price range. Powered by an economical 100cc 4 stroke engine it has plenty of power while remaining cheap to run. Weighing in at under 20kg, it’s easy to maneuver and a good pick for a small to medium sized lawn. Like the Hyundai, it is fairly good when it comes to restricting noise so you won’t be annoying the neighbours too much. The wheels can be adjusted into 5 pre-set cutting heights from 25-70mm giving you good control over the length of your grass. The biggest draw of this petrol lawnmower is its durability. Its chassis is made from Polypropylene meaning you won’t be getting any problems with rust. 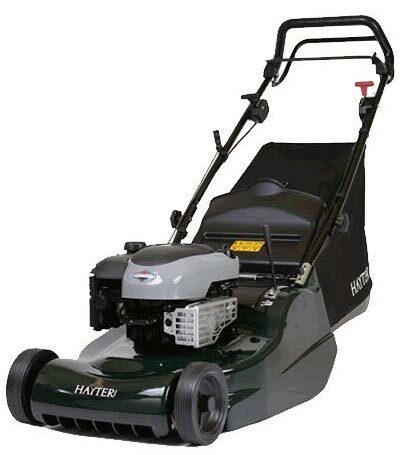 The Hayter harrier 48 is an electric start petrol lawnmower. It comes with a special key and chargeable battery that is used for starting up the motor first time every time, even straight out of the box! Although it is heavier than the two previously mentioned petrol lawnmowers, its build quality is far superior. Everything just feels high quality right down the nuts and bolts. It is self-propelling with multiple speed settings, so whether you’d like a leisurely stroll around the garden or you want to get the gardening done in a hurry before it starts raining, it’s available to you. This lawnmower is built to the last. It comes with a high quality, rust resistant aluminium deck and lifelong engine crankshaft guarantee. Flaws that have been reported are the engine flooding when the lawnmower is placed on its side and occasional problems with the grass bag coming loose. Another type of rotary petrol lawnmower is a hovermower. These have the same cutting action as regular rotary models but they designed to let air in through inlets on the outside of the lawnmower. This air is then pushed down by the fan creating lift. This makes hover mowers easy to move around and most have a design intended to make them even easier to maneuver. Perfect for medium sized gardens with odd shaped edges or gardens that have features that need to be steered around. They are not self-propelled but are light once they are turned on, so going up inclines is no problem. It has to be said though, they can feel heavy when trying to move them side to side and hover mowers won’t give you those nice stripes on your grass that we all like to see. Below I’ve included a review for the best petrol hover lawnmower for you to read. The XL500 petrol hover lawnmower comes to us courtesy of Flymo, one of the oldest and well trusted brands in this category. They have been successfully innovating and upgrading their products for over 50 years and the Flymo XL500 is another great addition to their stable. Packing a 160cc engine pumping out 5 horsepower, this lawnmower isn’t short on power, and as that engine is made by Honda, you can be sure that it won’t break time anytime soon, if ever. It has a wide cutting width of 50.5cm and 3 cutting height settings from 10mm-30mm. It comes fitted with a decompress lever which makes pull starting this petrol lawnmower easy….and start it will, usually first time thanks to the Honda motor. 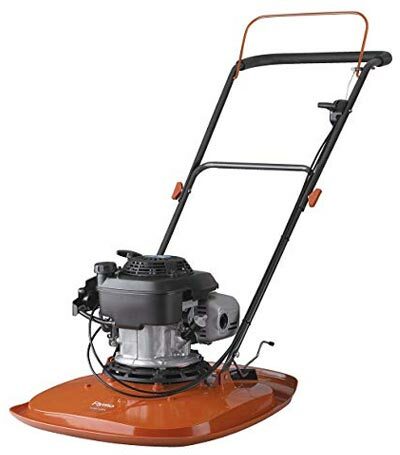 Although lighter (18.2kg) than the rotary petrol lawnmowers mentioned earlier, you have to remember that hover mowers don’t have wheels so you’ll have to carry it from where it’s stored to your lawn which might not be an easy task if you’ve got steps or a long driveway. Also, because of the way air is taken in from the outside of the lawnmower, cuttings and start to get in and this seems to make it feel heavier and harder to move. Another common complaint with this particular model is that fitting the bottom part of the handle can be tricky and requires some patience to get right. You also have to be careful when lifting this petrol lawnmower on its side as you can flood the carburetor if you lean it on the wrong side. There are clear instructions however. Hard to set up handle. Cylinder petrol lawnmowers are generally more expensive than rotary ones because they require a higher level of craftsmanship to manufacture. This is due to the precision blades and the fact that these lawnmowers have more moving parts. It is far more common to see people using rotary petrol lawnmowers in their gardens as cylinder mowers can sometimes have a hard time with long grass. On shorter grass, the quality of the cut that cylinder lawnmowers provide is superior. These types of lawnmowers are often used to cut bowling greens and such. 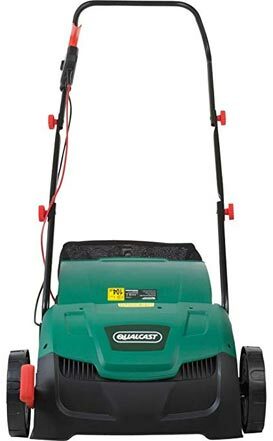 Qualcast are one of the oldest lawnmower manufacturers in the UK and are well renowned for their high quality machines. The classic petrol 35s petrol cylinder lawnmower is yet another top drawer product. It has great build quality and feels very sturdy so you don’t have to worry about bits of plastic flying off if you push it too hard or hit a bump somewhere. This is a cylinder petrol lawnmower so the cutting action is superb, and the fitted roller really helps to leave stunning looking finish to your garden. If you’re looking for perfect cuts and lines, then this lawnmower will deliver in spades. The height adjustment is easy and straight forward to use and will help you to have a professional looking lawn in no time. This lawnmower has a nice little feature where the blade cassette is easily removed by loosening a couple of Alan key bolts so you can always keep the blade nice and sharp. The only complaint I have heard about this model is one guy saying that the left side was cutting deeper than the right, but I don’t this would take much adjusting to fix. In conclusion this is a great little mower, well made and cut like a dream. ***Unfortunately, the manufacturer has recently discontinued this model but you could still get on your hands on a secondhand one if you keep your eyes open. They sometimes appear for sale on amazon and you could end up with a great deal as these machines are known to be very durable and reliable. Let’s start with 4 stroke. This the one that most petrol lawnmowers have fitted in them these days. 4 stroke engines run on normal unleaded petrol and require oil to be added separately to the fuel to operate. This dedicated lubrication system means that 4 stroke engines generally last longer than 2 stroke. With 2 stroke engines, the fuel is usually mixed with oil or a special additive because they don’t have a separate lubrication system. The fuel is burned with the added oil in it producing thick smelly smoke. They are more efficient than 4 stroke engines but also tend to be noisier. A lot of traditionalists will tell you that electric lawnmowers are inferior to petrol ones but, with advances in technology, it’s not hard to find an electric lawnmower that will fulfil all your grass cutting needs. There are 2 main types of electric lawnmower, ones with a power cord, and cordless models but both types share many advantages over petrol lawnmowers. Electric lawnmowers are more cost effective. You don’t have to keep buying petrol to fuel them and there is no need for oil or other parts required for petrol engines to work, such as sparkplugs and the like.This also makes them more reliable and less prone to breaking down. When it comes to noise reduction, you can’t beat electric lawnmowers. You don’t have to worry about waking the neighbours if you decide to do a spot of early morning gardening or upsetting the wife while she’s watching her favourite TV shows. Another advantage of electric lawnmowers is they don’t give off emissions like petrol models. With the threat of global warming possibly flooding our gardens with melted ice from the poles, it’s probably a good idea to be a bit environmentally conscious these days. Power-wise, petrol lawnmowers win hands down. Although electric lawnmowers have become more powerful over the years, they still can’t compete with something that’s fitted with an engine. Electric lawnmowers are great for small gardens but for a larger lawn, or one with tough grass, weeds and other debris, a petrol lawnmower is the best choice. One of the main drawbacks of electric lawnmowers is that they need to be attached to a power source by a cable, greatly hindering their mobility and range. It can be quite time consuming, not to mention annoying, to have to constantly be messing around with the power cables and being limited to the length of the cable. Those cables also have to be watched carefully, it’s far too easy to sever a cable and risk electrocution. Cordless lawnmowers, of course, don’t have this problem but their batteries have to be charged up before you can use them. Petrol lawnmowers tend to be higher priced but they also tend to have better build quality. 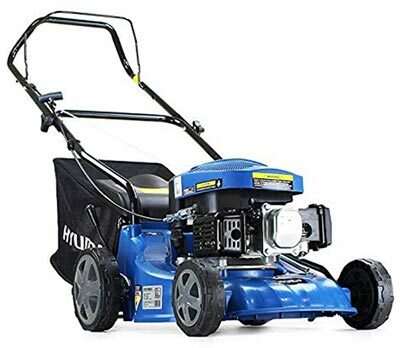 There are far more choices of well manufactured petrol lawnmowers out there than with electric models, which commonly have more molded plastic parts that are broken easier than good quality materials. So which is better? It all depends on your needs. If you have a small garden with neighbours in close proximity, you’d probably be better off with an electric lawnmower. Then again, if you have a medium to large sized lawn or you are using your lawnmower commercially, you should probably opt for a petrol lawnmower. I already mentioned about the 2 types of electric lawnmower. Now I’m going to review a couple of each from different price brackets that I deem to be the best. When making my choice for the best cheap electric lawnmower, I had to think of a few things. Firstly, is it good value for money? Secondly, is it practical for a small garden? And finally, what features does it have that makes it stand out from the crowd? The Flymo Easi Glide 300 is an electric hover mower with 1300 watts of power behind it. It has a 30cm cutting blade and can be adjusted to 4 different cutting heights from 12mm-32mm. 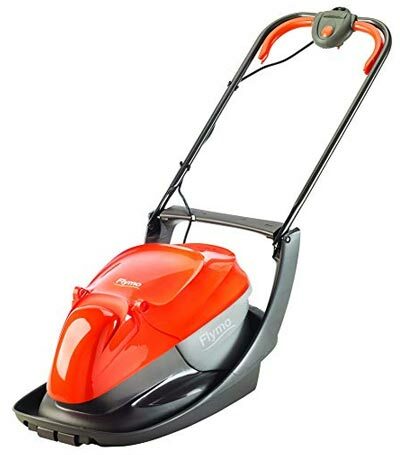 Weighing in at only 8.5kg, its very light for an electric lawnmower and makes cutting a small lawn a breeze. It also means that you won’t be breaking your back carrying out from the shed or turning it over to clean out. It comes pre-assembled and ready to use straight out of the box saving you the all too common, lawnmower related, frustration felt when dealing with nuts and bolts that just don’t seem to want to fit in the places they’re ‘supposed’ to go. Its compact design, along with the folding handle, means it won’t be taking up too much space in your garage and can be stored almost anywhere. It comes with a fixed 10m cable, that should be more than adequate for most small gardens but gardeners with larger lawns should really be looking for something in a different price range and/or category. The Flymo Easi Glide 300 comes with a 20 litre collection box which is very easy to empty. The grass is collected into a small bail making tidying up as easy as cutting and fallen leaves will also be sucked up into the collection box. There have been occasional reports of grass being blown out from under the lawnmower instead of collected but making sure the box is emptied frequently. It’s not all sunshine and roses though, this Flymo can have problems with very bumpy surfaces or the edges of the lawn, especially if they’re close to a patio or step. Also, it’s cheap price means that it’s been manufactured to at cut cost, so the materials used aren’t the most robust feeling. Then again, what do expect for 70 quid? It’s not without its faults but all in all this is a great little electric hover lawnmower, perfect for people with small gardens who aren’t all that bothered about being a professional gardener and just want something cheap, quiet and lightweight that gets the job done quickly. The Bosch Rotak range of lawnmowers are very popular with UK gardeners and this model, the Rotak 43, is the largest one available that requires a power cable. Built with a powerful 1800W motor, this midrange electric lawnmower is capable of talking lawns as large as 600 square metres. The cutting blade is 43cm of hardened steel that can deal with the toughest grass even when wet. With easily adjustable cutting heights between 2cm-7cm and the ability to cut right to the edge of your lawn thanks to its enhanced grass combs, this electric lawnmower provides amazingly well cut grass. When cutting a large lawn, you’re going to get a lot of cuttings. Fortunately the Bosch Rotak 43 has a spacious, easy to remove, 50 litre grass collection box that gathers the cut grass very well. When you see cuttings being left on the ground, it’s time to empty it and it’ll go back to sucking up everything. A nice feature of this electric lawnmower is Bosch’s trademark Ergoflex quick grip system which provides excellent control over the impressive torque created by the 1800 watt motor. The Rotak 43 is surprisingly lightweight, and it’s 16 kilograms feels effortless to push around and the design of the handle even helps you to maintain a good posture while mowing, helping to prevent backache. The criticism this electric lawnmower has received has generally been aimed at it is build quality. Some reviewers have spoken of the plastic body of the lawnmower feeling flimsier than expected and some small parts have been reported breaking off. Other people have complained about the length of the power cable which many felt was too short for an electric lawnmower that is designed to cut bigger lawns. The fact that the grass box came into parts was another thing some reviewers were unhappy about. Apart from these few minor things, the Bosch Rotak 43 has been widely received as a great lawnmower, with the vast majority of its reviewers giving it 4 and 5 star ratings. One of the main cons of electric lawnmowers is the need for a power cable. The need for such, of course, limits the range and mobility of the lawnmower. The answer to this is the cordless electric lawnmower. Cordless lawnmowers are generally more expensive than their equivalent corded and petrol counterparts but they also tend not to have as many of their common flaws either. For example, they are quieter and more environmentally friendly than petrol lawnmowers yet also have much more range than corded mowers. Cordless lawnmowers negate the need for a power cable by using a battery as their power source instead. Obviously, this brings about the problem of battery longevity and power output and requiring you to remember to charge the battery when not using the lawnmower. If you’re thinking of buying a cordless lawnmower, I’d suggest investing in a spare battery or two so you can keep one charged and ready to go at all times. This brings us some more reviews. These are of cordless lawnmowers that I’ve picked in the equivalent price range as the corded ones above. 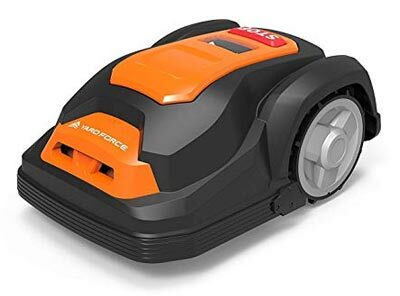 After looking through the options, I’ve found myself torn between two cheap cordless lawnmowers: the Flymo Mighti-Mo 300 Li Cordless Battery Lawn Mower, and the Aerotek Cordless 40V Series X1 Lawnmower. In the end I decided to review them both for you. My first choice for cheap cordless lawnmower is the Mighty Mo from Flymo. 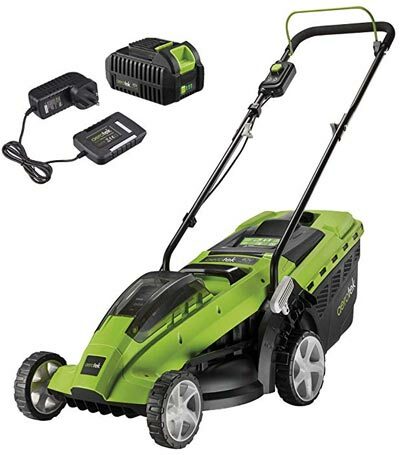 It is powered by a 40V li-ion battery that comes with the lawnmower along with its charger. This battery provides enough power for the mighty mo to cut lawns up to the size of a tennis court, approximately 250 square metres, on one charge. The design of this cordless lawnmower makes the battery very easy to remove for charging and reinserting. The mighty mo has a 30cm blade and can cut at 5 different height adjustments. It also cuts nice and close to the borders of the lawn and has enough power to provide a nice clean cut. At under 10 kilograms, and of course being cordless, this compact electric lawnmower is very easy to handle and move around. It also makes carrying it and storing it a piece of cake. The grass box is big enough to hold 30 litres of cuttings but there have been reported issues with this not being powerful to pick up all the grass. As with all low priced lawnmowers, people also complain about the build quality. The main drawback of this particular model is that the spare batteries are very expensive (over 100 quid) and some reviewers have talked about their original batteries becoming less effective after a year or so. Priced at just under £179.99, around the same as the Flymo Mini Mo, and also having a 40V Li-ion battery, the Aerotek Cordless Series X1 is for sure it’s main competitor. At 16.7 kilograms it’s slightly heavier than the flymo but not enough to be noticeable. This is still a very lightweight cordless lawnmower that should be easily manageable for the vast majority of people. At 37cm, the Aerotek’s cutting width is 7cm wider than the mighty mo and it also offers the same amount of height adjustments (5 adjustments from 25-75mm). The Aerotek also has a larger grass box, holding 40 litres as compared to the 30 litre grass box of the Flymo mini mo. 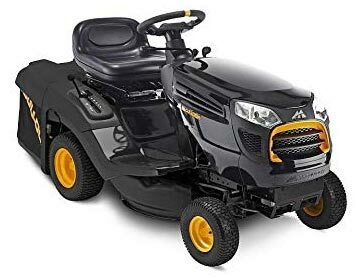 This lawnmower also shares some of its competitor’s faults however, namely expensive spare batteries and low cost lawnmower build casting doubts on durability. The battery can also be quite hard to connect to the charger, requiring a fair bit of pressure and there have been complaints from reviewers that the instructions could be easier to understand. Bosch have come up trumps again with this mid-range cordless lawnmower. It comes with not 1 but 2 lithium-ion 4.0Ah batteries, insuring that you always have a spare to get the job done. The 36V batteries supply the energy for the torque providing Bosch Power Drive li plus motor system, capable of making light work of even the most stubborn grass and good for gardens up to 600 square metres. It is easy to assemble thanks to being designed with a quick click system that requires no tools, having you up and tackling your lawn in no time. Having said that, the grass box can be a bit fiddly too set up but you’ll only have to do it once and then you can get on with the mowing. And mow you will. This innovative cordless lawnmower has a 43cm hardened steel blade to do the cutting and great air flow to back it up leaving great lines on your lawn at lengths from 20mm-70mm. Although this particular Bosch Rotak isn’t self-propelled, it is extremely light, weighing less than 10kg so you are free to go at your own pace without breaking your back. This lawnmower has a 50 litre grass box that should save you having to empty too often and it also comes with a mulching feature but you must purchase an accessory, in the form of a plastic tray that fits on the back, to make it work properly. Two of the best features are the power command function that allows you to easily and instantly switch power from one battery to the other, and the edgemax design which makes cutting right to those edges and borders child’s play. Criticism for the Bosch 430L cordless lawnmower has been mostly aimed at the ammount of plastic on the body leading people to think it’s flimsy, and the rear roller not doing a good enough job. People have reported problems ordering spare parts too. 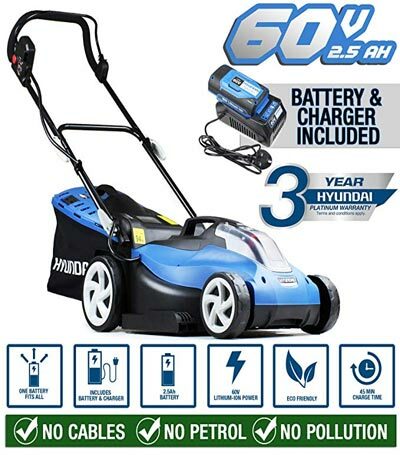 Car manufacturer Hyundai have put their knowledge of building reliable motors into this offering of a cordless lawnmower. The motor in question is a brushless model. Brushless motors are very durable, require no maintenance and produce less noise than they brushed counterparts, which are often used in lower quality lawmowers. They also provide high torque, longer run times and are energy efficient. This model is powered by an LG 58v Lithium-ion 2.5Ah battery that should provide about an hour of mowing under good conditions. The battery has an average charging time of 45 minutes and should be good for over a thousand charges in its lifetime. A nice feature is the battery level indicator which is easy to see on top of the machine. It has a 38cm cutting width and is adjustable from 20mm-70mm adjusted by a single lever, which is easy to use and cycles through the cutting heights in no time at all. The cuttings are either collected in the 45 litre quick release grass box or discharged from the side, your choice. It is also fitted with a rear roller to help you get those sought after lines on your lawn. Instead of a cable-pull start, this cordless lawnmower from Hyundai is started by inserting a safety key, then pressing the lock-out button, and finally pulling back the Operator Presence Control lever. This cordless lawnmower is lightweight at just 12kg and the height adjustable handlebars also fold over so moving and storing is no hard task. The EGO power+ is touted as the most advanced rechargeable mower on the market and, I’ve got to say, I tend to agree. This product from EGO is Powered by 56-volt lithium-ion battery that, on average length grass, gets you about an hour of usage before the battery needs to be recharged. Luckily, it only takes about 40 minutes to fully charge the battery. Unfortunately, the batteries and charge don’t come with the lawnmower and have to be sold separately. There are 4.0Ah, 5.0 and 7.0Ah battery kits available that all come with a rapid charger and come with a 3 year warranty. Cutting prowess comes your way courtesy of a 600 Watt high torque motor and a 20 inch cutting deck that should lower the number of passes you have to do in order to get a beautifully mowed lawn. The cutting height can be adjusted to 5 different settings from 20mm-70mm. Some of my favourite features are the LED headlights, allowing for some late night or very early morning gardening, and with this cordless lawnmower being very quiet, there’d be no excuse not to. Another one is the fact that this lawnmower has been designed with a 3 in 1 function to deal with your cuttings- Mulching, rear bagging and side discharge, all working very well and easy to switch from one to the other. 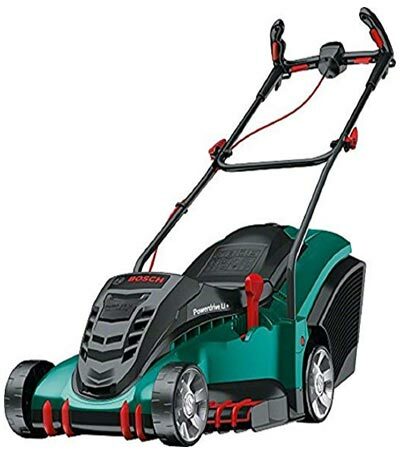 Compared to other cordless lawnmowers in the same price range, this EGO model is fairly lightweight at only 58 pounds so storing and directing it around shouldn’t be much hassle. The design is stylish and practical. The lawnmower starts by a push button instead of a pull cord and the whole unit folds up so that it takes as little room up as possible in the garage. Now to the downfalls of this overall impressive machine. As with all cordless lawnmowers, the batteries are expensive and this model doesn’t come with any included so there is the additional cost to think of. Also there have been a few angry reviews aimed at the customer service offered by the manufacturers such as not answering the phone and long repair times. 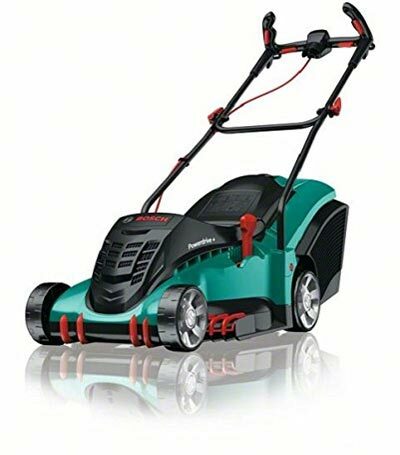 This cordless lawnmower from Yard Force is advertised as delivering true petrol mower performance. Powered by a 108V Samsung Lithium-Ion 2.5Ah battery, it should be suitable for lawns up to 1000 square metres. The battery should last around 55 minutes and take 40 minutes to fully charge. This battery powers a brushless motor, giving out lots of torque. On top of that, this model has torque-sense technology. These are intelligent sensors that are built into the motor and measure and then optimise the cutting performance. For example, it will provide more cutting power when needed yet will save energy when things are going easy. Very clever. This is a self-propelled cordless lawnmower with an adjustable drive allowing you control over your mowing speed. You can take it easy on the flat parts and then rev it up to tackle the inclines. At 37 kilograms it’s not the lightest product available and make some getting used to, but it’s folding design does make it easy to store away and the lawnmowers well built wheels really help with manoeuvrability. The Yard Force cordless lawnmower has a 46cm steel cutting de adjustable into 7 positions, and a 55 litre grass collector with an indicator to let you know when it’s full. It also has a 4-in-1 mode of bagging, mulching, and also side and rear discharge options. As with most Yard Force products, the build quality on this lawnmower is excellent. It feels robust and well put together and I have no doubts that it will be long lasting and durable. I’ve tried to find some negative things to say to balance this review out but I couldn’t really think of any. This really is a fantastic all-round product that I would definitely recommend. The high price might put some people off. Another type of electric lawnmower available these days are the new robot lawnmowers. Robot lawnmowers are clever, fully autonomous devices that cut the grass for you, leaving you to sit back and enjoy watching someone else do the hard work while you reap the rewards. Earlier generation models required you to set up a boundary wire to help guide the robot, but with advances in technology, there are some models that don’t need this to function anymore. Robot lawnmowers have actually been around for a long time. The first was called the mow bot and was patented as early as 1969. The popularity of these machines has really taken off in the past 6 years though, partly due to the explosion in smart phone usage. Some robot lawnmowers come with dedicated smart phone apps that allow you to program the mowing schedule and even take control of the robot using a digital joystick. Modern robot lawnmowers are very sophisticated. Some are self docking and have sensors that guide them around obstacles and even sensors to tell when it’s raining. Some people are put off robot lawnmowers because they require some programming to set them up for your particular lawn and also because they can be very expensive. 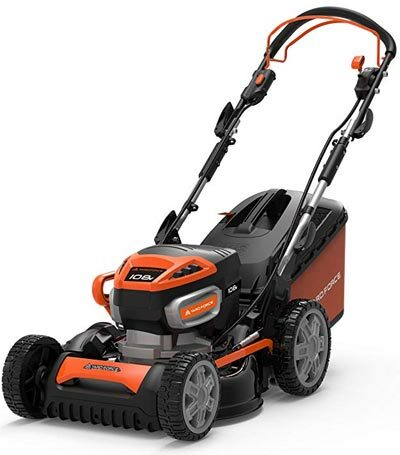 The S300 Landriod from Worx is my first pick in this budget lawnmower category. It is available on Amazon for 477.98 pounds. it’s powered by a single lithium ion battery that comes with the lawnmower. In operation, this robot lawnmower runs very quiet at about 68 decibels and should be able to manage gardens up to 350 square metres. Great for people with ‘techno fear’ the S300 Landriod doesn’t need to be programmed. Simply set up the wire boundaries and the machine will do the rest. It has a dual blade cutting action where the blades spin in both directions. This makes the blades last longer and lengthens the time before you need to change them. The way the Landroid cuts, little and often, actually leaves tiny clippings back in the soil, fertilising your garden for you. It also cuts close to edges, leaving an uncut area of just 2.5 cm. Like most modern robot lawnmowers, the Landroid is fitted with sensors to let the machine know important things. For instance, it can sense rain and won’t come out to cut until it’s been stopped for a while. It can also sense when the battery is running low and will return itself to it is docking station to be charged. Other sensors, plus the lawnmowers AI, guide the Landroid through narrow channels. The all terrain wheels help this robot lawnmower to move over uneven ground and up gradients up to 35%. Of course, the Landriod has it is faults. Firstly, one of it is draws is also one of it is drawbacks depending on your preference- it can’t be programmed. This might be great for some, but for others who like more versatility and control over their robot lawnmower, it could be an issue. Also, there seems to be a lack of documentation or online support in the way of an instruction manual. All in all, the Landroid is a decent budget robot lawnmower best suited to people who are looking to save time and aren’t too bothered about being able customise their mowing schedule. Ok, let’s take a look at another robot lawnmower for under 600 pounds. This offering from Flymo is currently available on amazon at a price of 509.99. It’s powered by 18 v 1.6 Ah Lithium-ion Battery that will give you about 60 minutes worth of action before it needs to be recharged. When the battery runs out the robot lawnmower will return to its docking station automatically and charge itself. The Flymo 1200R robotic lawnmower measures 69 x 52 x 39cm and weight only 7.4 kg when unpacked and it is suitable for gardens up to 400 square metres. It is even quieter then the Landroid, producing only 58 decibels, the same as a normal spoken conversation. The 1200R cuts with razor sharp swing back blades with a cutting width of 17 cm and can be adjusted to cut from 20mm to 50mm. Like the Landriod, the cuttings are mulched as the machine mows helping to fertilise your garden and eliminating the need for raking. Unfortunately, because of the way it cuts, this robotic lawnmower doesn’t leave stripes on your grass. A great feature of this robotic lawnmower is that it cuts in an irregular pattern insuring that all areas of the lawn get cut so you won’t be left with a patchy garden. When it bumps into an obstacle, it changes direction and continues mowing. This Flymo is easy to set up and comes with a manual and quick-guide to help you along so you should be up and running in no time. Unlike the Landriod, the Flymo 1200R can be programmed to cut on a schedule to your suiting. Just tell it what times and how often you want it to cut and leave it to do the rest. 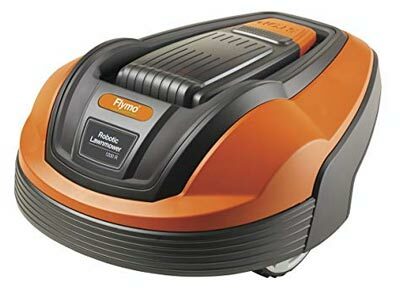 The negatives to the Flymo are the same as most robot lawnmowers, you have to spend time setting the guide wire up and it won’t cut all the way to the edges of your lawn. This model has also been known to cut through its own guide wire on occasion and to run out of charge before making it back to its charge station. So, although the Flymo 1200R is not without its faults, the vast majority of the reviews it has received have been very positive. 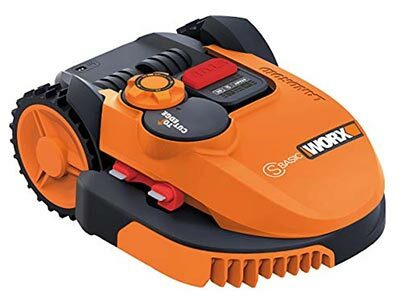 The first thing you notice when you compare the Yard Force SA500ECO Robomower to the two previous budget options, is that it has a much sturdier feel due to its great build quality. The robomower gets its power via a 28V Samsung lithium-ion 2Ah battery and is good for gardens up to 500 square metres. It has a 60 minute running time and takes the same amount of time to charge, which, like most robot lawnmowers, it will do automatically when it runs low on charge. Although not fully programmable, you can select what mowing hours you would like the robot to work for you and then it will repeat the process every day. 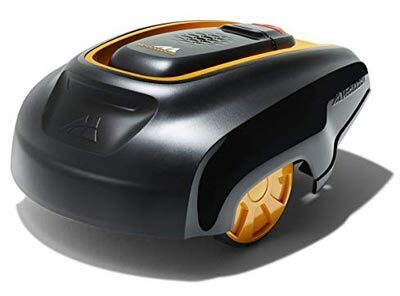 Apart from the long set up time that is the problem with nearly all robotic lawnmowers, this Yard Force model also has another drawback- its docking station is comparatively quite large and could take up fair bit of space. That concludes the reviews for the cheapest robot lawnmowers. As you can see, there isn’t much to choose between them as they share very similar features. As always it just comes down to personal preference. The McCulloch ROB 1000 Robotic Lawnmower is designed for gardens up to 1000 square metres. It comes with 3 cutting blades, the boundary wire and 400 staples for you to set up with. It runs very quiet, almost unnoticeable and will do so for around 65 minutes before it will return itself to its docking station and charge. Charging time is fairly quick at 50 minutes. The ROB 1000 robotic lawnmower has a cutting width of 17cm and adjustable cutting heights of 20mm – 50mm. Like most robotic lawnmowers, it cuts the grass, mulches it and feeds it back as fertiliser. It can cut nicely on slopes up to 14 degrees. Apart from the competitive price of 628.99, another thing I like about this lawnmower is it’s fully programmable. You can set the days, times, frequency and even the cutting length. It also follows an irregular cutting pattern that gives your grass a nice uniform cut. McCullochs ROB 1000 robotic lawnmower has good security features. Firstly, it has a PIN code feature that needs to be entered to change the machine’s settings. Secondly, each machine is paired with a specific charging station and won’t work with any other. Thirdly, it is fitted with an alarm that sounds if any would be thief decides to take it for a walk. Once the alarm sounds it can only be turned off with the correct PIN code. Although it has to be said, the alarm could have been made to be louder in my opinion. Apart from the quiet alarm, other complaints that have been made about the ROB 1000 is that it’s susceptible to water damage and also that it is complicated to set up, but this is a complaint made about nearly all robotic lawnmowers. There are also little details that need to be known before purchasing, like the charging station needing to be on very flat ground (no more than 3cm height difference from one end to the other) and the fact that flower beds and such need to be protected by a 6 inch barrier so that the robot will bump into it and turn around. Priced at £923.62 , the Gardeno Smart Sileno is at the top end of our mid-range prices, but is the price justified? Time for a closer look. This robotic lawnmower runs on an 18V lithium battery that runs on average for 65 minutes, the same as the ROB 1000. At around 50 minutes, the charging time is also the same. It is designed to be able to cut lawns up to 1300 square metres and slopes up to 35%. Pretty impressive. With dimensions of 63x51x25cm, it’s bulkier then the ROB 1000 but, at 8.5kg, weighs only 1.5kg more. The bigger frame houses a larger cutting deck of 22cm, significantly wider than ROB 1000’s 17cm and the 3 thin razorblades leave a nice cut at multiple height adjustments from 22mm to 60mm. Gardena’s smart Sileno robot lawnmower is part of their smart system gardening range and can be linked up to other products in that range through an internet router. You can also get the gardena smart system app for your smart phone (both ios and android) and control your new gardening toys from the palm of your hand. The Smart Sileno really is smart. It has sensors that can read how long the grass is and will only cut it when necessary, saving energy. It also has a very good navigation system that allows it to guide itself through areas and channels as long as they are wider than 1.5 metres. As with the ROB 1000, the Gardena robot lawnmower has a PIN system and alarm for security. It also has a lock feature that stops anyone using it without the pin. There you have two robotic lawnmowers from either side of the mid-range price spectrum. With the extra features of the Gardena model, it seems like you really do get what you pay for in this category. Now for the big boys. We will be doing a couple of robotic lawnmower reviews based on machines over 1000 pounds. Let’s begin, shall we? Priced at just over 2600, our first high end robot lawnmower comes from Husqvarna and is named the Automower 440. Made to tackle lawns up to a massive 4000 square metres, its lithium-ion battery will have it running for 290 minutes on a single charge before the unit returns and self-charges to full charge in 1 hour. These stats make it a possible alternative to a ride-on mower. 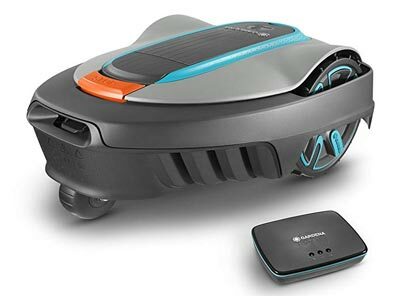 The Husqvarna robotic lawnmower’s dimensions are 72x56x31 cm and it weighs 12.9kg. The cutting deck comprises of 3 pivoting razor blades that provide an excellent cut at a width of 24cm. The adjustable cutting height range is 20mm – 60mm. Like most robot lawnmowers, it mulches the cuttings automatically while cutting. A large 19 button LCD display gives you access to the lawnmower’s features such as timer, PIN code, alarm, height adjustment and more. The Automower 440 has a feature the manufacturers call a weather timer. Basically this robotic lawnmower knows when and when not to cut the grass and will adjust itself automatically. It will cut more frequently during periods of growth and less in dry sunny weather. Another feature is the use of profiles. You can set up, name and save numerous profiles, each with its own specific settings and preferences so using this robotic lawnmower on more than one location is made easier. It also has a mode called spot cutting. You can select this mode when you want the lawnmower to stay and cut in a small specific area that has longer grass. When this mode is activated the Automower 440 will cut the selected area in tight spirals. When the lawnmower senses the grass is the right length, it will automatically switch back to normal operating mode. This is great for when garden features or furniture are moved leaving long grass patches. The Automower has been designed to be robust and to deal with the usually harsh and sometimes extreme weather conditions of Nordic countries. It is weather proof so you don’t have to worry about a little bit, or even a lot of rain causing it any problems. The electric motor is powerful and allows this robotic lawnmower to cut beautiful, carpet like grass on slopes up to 45%. This model runs very quietly at only 56 decibels and is very energy efficient. However, the main feature that sticks out for me is that this machine is guided by dual guide wires that seriously reduce the time the machine spends searching. This plus its onboard sensors makes it great for gardens with complex designs, odd shapes and lawns with plenty of obstacles and small passages. To sum up, this is a very robust, well designed robot lawnmower with some great features and not many drawbacks. 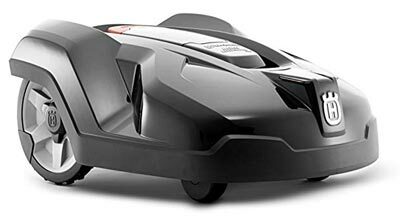 This is one of the most expensive robotic lawnmowers out there with a price tag of £4,496.34. The main reason for the high cost is the fact that the Ambrogio L60B requires no installation. While the vast majority of robot lawnmowers out there require you to spend at least a couple of hours setting up the boundary and guide wires, this one is wire free. It works through a sophisticated system of sensors that tell the machine where the borders of your lawn are. It even has sensors on the blades so that this robot lawnmower knows when it is over grass or not. The L60B uses four wheel drive to move around and it is brushed motors can tackle slopes up to 50% when not cutting and 40% while mowing. It is small and lightweight, with dimensions measuring 44x36x20cm and weighing in at 7.9kg. This makes it fairly manoeuvrable and allows the unit to get into smaller areas of your garden. The cutting deck is a 4 pointed star design that cuts at a width of 25cm and the lawnmower has reinforced bumpers so it will try to cut as close to the edges as it can without worry. Unfortunately, the Ambrogio L60B has a few flaws. Firstly, it’s only suitable for smaller gardens of 200-400 square metres. 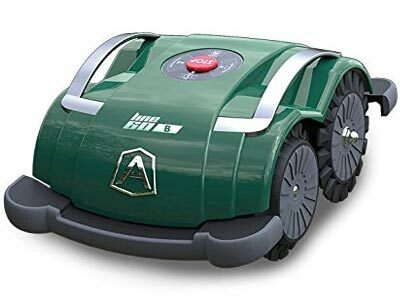 Secondly, this robotic lawnmower isn’t self-charging and it needs to be done manually, and finally, for such an expensive lawnmower, the run time is only 2 hours with an hour needed to fully charge the battery. In summary, the Ambrogio L60B is a step in the right direction with its no installation, no boundary wire operation. However, for such a high price I would have expected it to be able to tackle larger areas. Well, that review brings an end to this section on robotic lawnmowers. I hope that it has given you a better idea of the different models and features available at the moment. For our last section of reviews, I have chosen ride on lawnmowers. First we’ll cover the benefits of ride on lawnmowers. For those of you with large lawns to mow, a ride on lawnmower can be a good choice. They usually have a large cutting width to really help reduce the amount of time spent mowing. Also, because you are seated on top of the lawnmower, you should be more comfortable and there is less chance of getting tired or hurting your back through repetitive strain injuries. Based on your standard car with a steering wheel and pedals, controlling ride on mowers is familiar and easy for most people. What are the cons of owning a ride on lawnmower? Well, first of all they are only really suitable for large gardens and properties that have ample storage space. Some ride on lawnmowers have big turning circles that require a fair bit of space, although it has to be said that ‘zero turn radius’ mowers are a solution to this problem. Another thing to think about when considering buying a ride on lawnmower is the price. These types of lawnmowers tend to be considerably more expensive than your average stand behind lawnmower. With a 1299 price tag, this Troy-Bilt ride on lawnmower is one of the more affordable available. 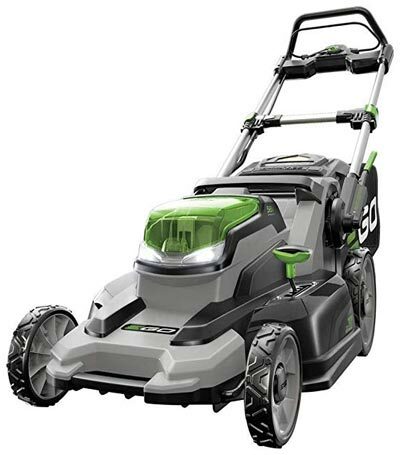 It has a 382cc engine that has an auto choke feature and a 6-speed transmission that helps this lawnmower reach a top speed of 4.25 MPH over even terrain. The compact dimensions of this riding lawnmower make it a great choice for medium size lawns. 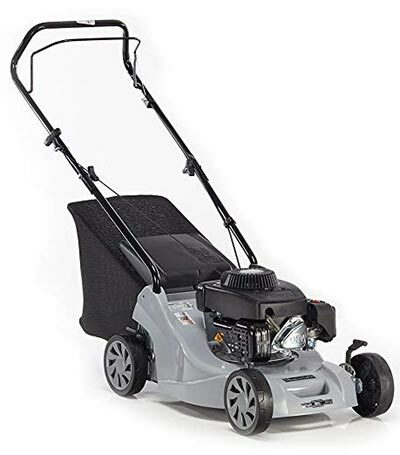 The 30 inch cutting deck keeps this model’s overall width at a size that is far more suitable for people who want the comfort of a ride on lawnmower but are worried about how much space it will take up. It has a fairly comfortable mid-back seat and soft padded 13 inch steering wheel to see you through your gardening without too much discomfort. An 18 inch turning radius coupled with 13×5-inch front wheels and 16×6.5-inch rear wheels also make this 382cc riding lawnmower easy enough to manoeuvre. The fuel tank has a capacity of 1.3 gallons that should be more than enough to finish the job on a medium sized lawn. The cutting quality is excellent leaving your grass with a golf course green style finish. On the negative side, there has been complaints of issues with Troy-Bilt honouring the warranty and that the illustration in the manual for changing the oil is wrong, which could lead to making a mess. 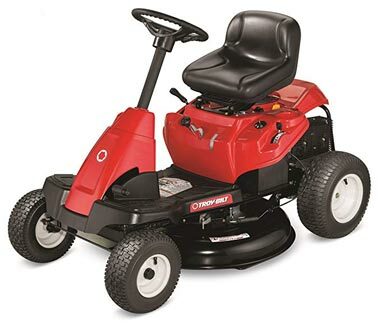 Overall, this ride on lawnmower from Troy-Bilt has been widely praised and has been positively reviewed. The McCulloch M115-77TC is another compact ride-on lawnmower suitable for medium sized lawns (1500 square metres). Like the Troy-Bilt lawnmower above, it has a 30 inch cutting blade that keeps its dimensions small enough for it not to take up too much space in the garage and to fit through most gates easily. The engine is a 344cc Briggs & Stratton Series 3 PowerBuilt model which gives this ride on lawnmower 11.5 horsepower. No supercar by a long way but enough to keep your garden healthy. As already mentioned, the cutting blade is 30 inches and the cutting height can be adjusted with an easy to reach lever to 6 levels from 20mm-80mm. The large grass catcher on the rear of the lawnmower can hold up to 200 litres, not the largest for a riding lawnmower but you still won’t have to stop to empty it too often. It can also be emptied straight from the driver’s seat, no need to get up from the lawnmower. If you prefer doing your gardening in the evening, the McCulloch is happy to oblige with its twin headlights to light the way. It has a nice looking sleek design and the black enamel painted steel frame looks great but we all know that black things get hot when under the sun for a while. This ride on lawnmower is comfortable to operate with a soft seat and comfort grip steering wheel, and the controls for activating the cutting blade and height adjustment are in easy reach. Out of the two budget ride on lawnmowers reviewed, this would be my number one pick. 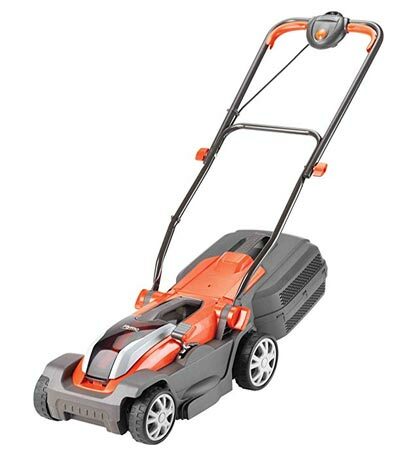 This good all-round lawnmower is available on Amazon for £1,586.46. That final review brings this article on lawnmowers to a close. We have covered a fair amount of different styles, price ranges and variations and we hope we have done so without causing too much confusion. Our goal, as always, is to present you with enough information for you to feel confident exploring further and making up your own mind. I hope that this is the case and I would encourage you to read our other articles that are just as information and review packed as this one.